Aline's academic art training and teaching career honed her skills as a figurative illustrator. After leaving an urban environment for country life in New Hampshire, her inspiration was redirected to rendering landscapes. 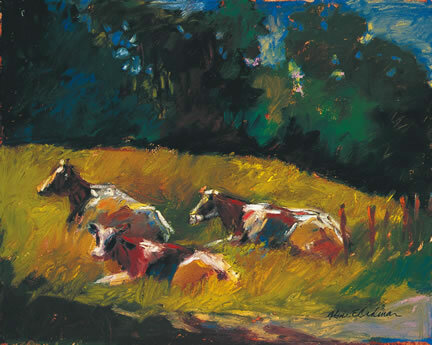 Her work now shows the synthesis of beautiful countryside and presence of human or animal influence. She usually works in pastels, striving to reflect the brilliance of color as light falls on a peaceful farm. She has been selected as one of 5 Women to Watch in VT under the auspices of the Nat'l Museum of Women in Arts, Washington, DC. Her work can be seen at Camden Falls Gallery, Camden, Maine, West Branch Gallery, Stowe VT, Gallery on the Green, Woodstock VT, Chasen Gallery, Richmond VA, Banks Gallery, New London NH.